The global financial crisis had significant negative repercussions for labour markets in many parts of the world. The most significant impact has been on employment figures. But the ILO Global Wage Report 2012/13, entitled “Wages and Equitable Growth”, shows that the weakening of the global recovery in the two years after 2010 was also reflected in average wages. Among the group of developed economies, real average wages (i.e. wages adjusted for inflation) fell by -0.5% in 2011, after having fallen a first time in 2008. Preliminary estimates based on quarterly data for 30 countries indicate that average wage growth in that group of countries was around zero in 2012. This contrasts with emerging and developing regions, where the growth of both GDP and real wages generally remained positive. 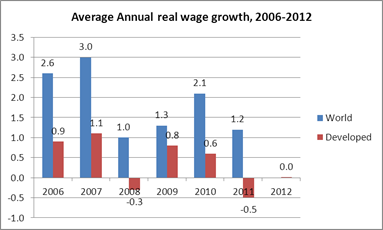 Looking at the world as a whole the report found that real average wages grew by 2.1% in 2010 and slowed to 1.2% in 2011. But remove China from the equation and things look only half as impressive, even in the developing world. Note also that it is too early for even preliminary global estimates for 2012 as only few developing and emerging economies produce quarterly wage data, and as annual wage data is often published more than 6 months after the end of the year. These diverse trends between developed and developing countries raise the question of whether the crisis has accelerated the convergence of wages at the global level. When one takes a step back and looks at what happened since the turn of the century, one can observe that in developed economies, real wages increased by a mere 5%, while globally wages increased by about a quarter. Particularly impressive is the case of China, where – according to official data – average wages more or less tripled over the same time (even though this data must be taken with a grain of salt, as its coverage is not as wide as in other countries). But before concluding “convergence” one should also keep in mind the huge differences that still characterise wage levels. At market exchange rates, 2010 hourly earnings in manufacturing ranged from less than US$2 in the Philippines, India or China, to US$23 in the U.S. and up to about US$35 in Denmark. So we are still far away from convergence! While wage levels follow different patterns in different parts of the world, one area of convergence seems to be that productivity has been growing faster than wages in recent years. The ILO Global Wage Report documents how, since the 1980s, the majority of countries has experienced a downward trend in the “labour income share”, which means that a lower share of national income has gone into labour compensation and a higher share has gone into capital incomes. This has happened where wages have stagnated, such as the U.S. or Germany, but it has also happened in some emerging countries where real wages have grown strongly, including in China. 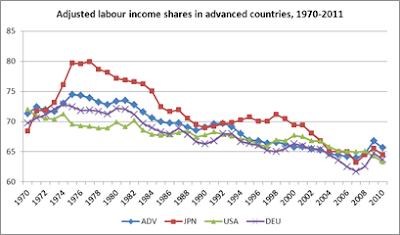 In a group of 16 developed economies the labour income share fell from about 75% of national income on average in the mid-1970s to about 65% in the years just before the crisis. In another group of 16 developing and emerging economies it fell from 62% of national income in the early 1990s to 58% just before the crisis. The decline in the labour share is a reflection of a broken link between the growth of wages and the growth of labour productivity – which should trigger much more research by academics and international organisations than it has so far. Why? First, on a social and political level the decline in the part of national income going to labour compensation and the corresponding increase in profits create perceptions that workers and their families are not receiving their fair share of the wealth they create. This can be a source of unrest and instability, especially when combined with austerity policies and the increasing inequality in the personal distribution of wages that is being observed in a majority of countries. Second, economic growth is badly needed – especially in Europe – and it must come from a rebalancing of demand in surplus countries, away from exports surpluses towards more domestic consumption. In theory, this can be done in several ways including through exchange rate appreciation (where this is possible) or macro-policies that stimulate demand, but part of the solution is also to ensure a close connection between the growth of wages and labour productivity. When one carefully reads recent IMF reports, one sees pretty much the same conclusion. In 2012, the IMF’s World Economic Outlook indicated that in Germany, where wages have severely lagged productivity growth in the last few years, the “strength in the labour market should foster a pickup in wages, inflation, and asset prices, and this should be seen as part of a natural rebalancing process within a currency union” (IMF, 2012, p.28). Some will inevitably respond that higher wages undermine employment. But in 2010 the IMF’s review of history showed that policy-induced shifts in demand from external to domestic sources more often increases than decreases employment. Rising consumption and investment typically offset the fall in net exports and employment gains in non-tradable sectors more than offset losses in tradable sectors. The ILO Global Wage Report tries to convince policy-makers that the right level of wages is one that maximises aggregate demand by being high enough to support domestic consumption, but evolving in line with productivity so as to prevent choking off exports and investment. The trick is to get the balance right between the share of national income distributed to workers and what is distributed to entrepreneurs. 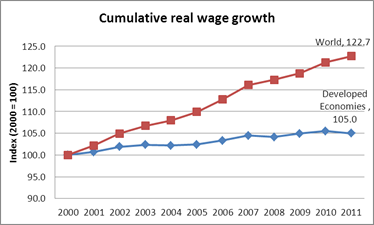 The idea that you decrease wages as much as possible to have rapid economic and employment growth might be fashionable among some people, but it is clearly wrong (see the latest GLC article by Özlem Onaran). Source: Stockhammer, 2012, from AMECO database. What can be done about declining labour income shares? First, international coordination is essential, because in a global economy the failure of any nation to let wages increase in line with productivity hurts the competitiveness and creates an obstacle in the way of other countries which desire to improve wages in line with productivity. Some coordination already takes place at the level of the Eurozone, but it seems to focus on cutting unit labour costs rather than ensuring an adequate labour share in national incomes. And as pointed out above: cutting wages across the board is a recipe for economic stagnation, not economic growth. Coordination should involve social partners, not just governments. Indeed, wages do not increase in line with productivity just because governments would like it to happen. Where institutions exist, wages are at least partly an outcome of union strategies and the coverage of collective agreements. In Germany, for example, wage moderation was the result of both union strategies and wage declines in the non-unionised sector. In France, extensions mechanisms of collective bargaining have ensured a closer connection between wages and productivity. Minimum wages should also be set by taking into account both the need of workers and their families, as well as economic factors, including levels of productivity. But there is a need to look beyond the labour market institutions and policies. The ILO Global Wage Report found that the ways financial markets operate are part of the explanation for the decline in labour shares. Shareholders are now often anonymous and aggressive return-oriented institutions, like private equity funds or hedge funds which invest huge amounts of resources and demand high short-term profits or else they dis-invest. This greater power of such shareholders has brought about the maximisation of shareholder value (dividends and share prices) through managers who are paid with stock options or bonuses linked to profits, or through practices such as “share buy-backs” in which companies use their cash and/or debt to buy back their own shares with a view to increasing short-term profit and dividends of remaining shares. Financialisation has also been characterised by higher corporate debt and investment in risky financial assets. These practices have placed strong pressure on the wage share. To reverse the trend financial markets must be regulated so as to create the right incentives, again, for companies to invest in productive capacity and to reward workers for productivity gains. Finally, because private household consumption depends on disposable income, rebalancing can also be achieved through redistribution. And here it would make sense to open a broader debate on the taxation rate of capital incomes relative to labour incomes. In emerging economies, putting in place stronger social protection systems - particularly pensions - would also help consumption by reducing the need for precautionary savings. 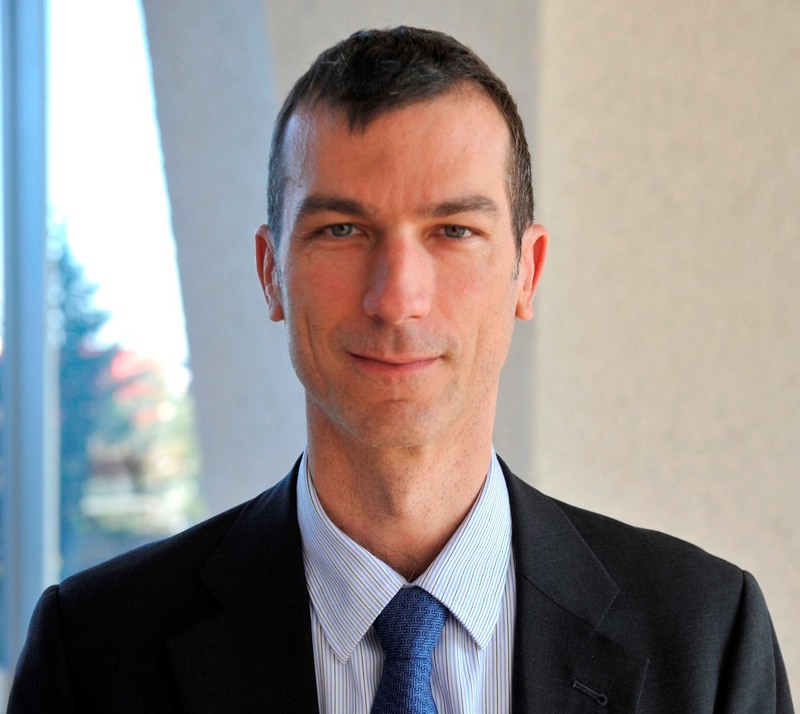 Patrick Belser is the principal editor of the ILO Global Wage Report. Before working on wages, he spent 5 years with the ILO programme on fundamental principles and rights at work and co-edited a book called Forced Labor: Coercion and Exploitation in the Private Economy, published in 2009 by Lynne Rienner.